Though there is no exact formula for measuring a fireplace for gas logs, we believe the techniques listed below will help you determine the size logs that will best serve your needs. 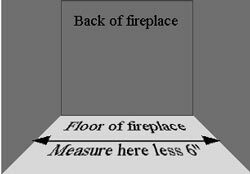 Measure the middle width of the fireplace minus 6 inches. Buy the logs that are closest to that measurement. We also have a sizing chart on each gas log page that will assist you as well or if you have real logs and a grate handy, you might try stacking the logs on the grate to make sure they fit inside your opening and then measure the actual logs. If you don't have real logs at your disposal you might also try using cardboard or newspaper as an alternative (see below).